← Watching the front roll through. I am overwhelmed by this update. Everytime I start writing I remember a new detail. Why haven’t I done this post before now? Why have I left it so long when so many of you have been so eager to hear of Bede? Well because I try and pick a moment in time when I can give you all a clear idea of where were at and over the last two weeks the landscape has constantly been changing. Everytime I have found my feet the world has gone hurtling off in a new direction and so many times, as we are in this moment, we have been left waiting for time to pass, for something to declare itself, for the doctors to catch up, for confirmation. We haven’t been able to find our feet. I have written pages of details tonight but that is numbing. It all boils down to this. The moment we were least expecting it, after a gorgeous night with friends, things turned. No one could figure out why but I knew there was an infection. 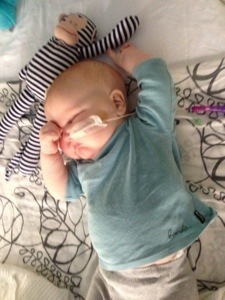 His oxygen levels kept dropping really low and he turned blue a couple of times over the coming week. I thought there was an infection so I postponed chemo and him having a depleted immune system. The doctors were happy to forge ahead so we did. There were CTs that said different things depending on who you asked. The tumour had a fresh bleed. There is no fresh bleed. The tumour is not swelling. These oxygen problems are from the cancer you need to brace for losing him. This is not from the cancer but we cant figure out what it is. You need to consider signing Do Not Resuscitate forms in the near future. My strong recommendation is that you do not sign Do Not Resuscitate forms at this stage. His brain ventricals aren’t enlarged. All the time in the background I know he has an infection and despite their best efforts they’re missing it. They tap his shunt which involves inserting a needle in to the lump on top his head and drawing back and seeing if any brain fluid comes out. It came, that meant the shunt wasn’t blocked, that wasn’t the problem. Here I am quietly and calmly wondering what next. I called Gus and told him Bede had another sickness in his brain. He asked if it was weak. It’s a hell of a lot weaker than Bede, my beautiful son. Ultimately we don’t know where we stand. There are risks we are hoping to avoid. There are things we are hoping will happen. Right now we’re in limbo. Waiting for the world to shift again. In two weeks when it has felt like the world has turned a thousand times and the land scape shifted with each one of those turns one thing has stayed unmoving, Bede. He is solid and he is heart breakingly beautiful. His soul is profound and wraps me up as his little fingers reach out and they find my lips or my ear and they explore, tip toing around my face, defining his limits. He is soft and tender and divine and he glows. Softly and gently and unassumingly his glow lights the way. Willing him to know his worth. Willing him to know his foot print on my heart is deep. Willing him to know I recognize his fundamental greatness and I promise the world has taken note. I care for him so much and in so many ways. I care that he knows the world is beautiful and that hears beautiful words but sometimes I am at a loss for words that are filled with beauty. So I read to him a poem. A poem I rediscovered when I was pregnant and felt so deeply back then that this poem was intrinsic to our connection but didn’t understand why. Usually I have my own words but when I don’t I borrow Mr Cummings’ because if I know only one thing it is that Bede is truly a once in a life time wonder. There is so much more to say but tonight I am overwhelmed by the telling. I will come and share all the happiness and all the triumphs of the last few weeks over the next few days because of course with Bede there is always so much joy. I will better update you on Bede’s little soul not just the happenings, tonight I knew many of you were waiting to know where we were in this moment. Where we are is that brain cancer is throwing Bede the worst its got and he is meeting the challenge with grace and beauty and gentleness and fortitude and light and love. I am painfully thankful for my son. Now we are watching, once again, the mighty Bede demonstrate his grandeur and Roy and I are in awe of him. 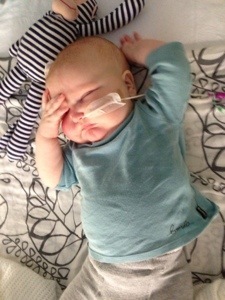 This entry was tagged baby bede, bede, brain tumour, Poetry, team bede, Tumor. Bookmark the permalink. Thank you for finding the strength (and I don’t know how you could possibly find any more than you have already) to make another post. My prayers are with you and if course with your amazing son. All your baby friends are praying. Issy & Roy I am amazed at your strength may Jesus continue to support you. I’ve been trying to find the words to convey how very much I wish for Bede to come through this. I have such faith in medicine and science, that Bede will have a helping hand in his fight and in the same breath I see how much doctors are bewildered and confused by this, I see how in many ways, you have been let down by medicine. I am in awe of you and Roy, of your courage and persistence. There is no doubt in my mind that your careful observation, advocacy and love is the vital thread helping Bede through. Hi Bede , we do not know each other but we know your brother’s friend Maya. Maya and our son Nicholas were good friends and they used to play together in Trigg. We now live in Glasgow, UK, and we have got your message from Maya’s mum, Catherine. Please be sure that we will keep your family and you in our prayers. 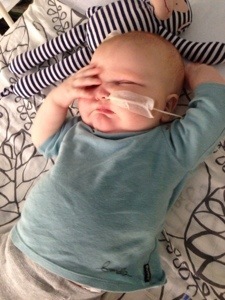 Unfortunately some of the babies have a tendency to get bugs and all types of sickness more than others. Very sorry to know that you have got some of the nasty ones. Not fair! Rest assure that our prayers and good thoughts will help you will be very happy and healthy and as soon as possible you will be going back to your home. Love and peace, Sandra Pereira and family. Again you bring tears to my eyes, such a beautiful boy and such an amazing and inspiring mum and dad. Like always, so beautifully written and a welcomed update. Blessings dear people. What amazing things the four of you have achieved against so many odds, keep going there are many more blessings to come for you all. There are many of us out here whom you don’t know, who are thinking, hoping, praying, lingering, in awe of your strength and love. I don’t know you and I’m not even sure how I came to know of Bede, but for a while now I have been checking in regularly. Just wanted say that Bede is noticed and thought of with love and hope. How beautiful! He sure is thought of by so many with love and hope. Always Always Always! We love you Bede! We don’t know each other but on the 3rd June I was so moved by your words about your precious little boy that I have been checking in now and then, praying and hoping for good news. Your strength and courage is an inspiration to us (mums) . Bede, you truly a brave, resilient beautiful boy and I pray that your months of fighting pay off for you. Thinking of you and sending you prayers for strength and hope. Your beautiful little boy is important and he matters to me even though I will never meet him. I just read your amazing blog and I am speechless and have no words of wisdom for you because you have really so succinctly detailed your journey and emotions and shared beautiful wisdom for everyone. Shelley it was such a treat to meet you the other night you are so lovely and I feel very humbled that you took the time to read the blog. You have such a generous spirit. I hope one day I get to meet Matt although I am content in the knowledge he has had such a positive impact on me already. His brilliance is far reaching. I hope to see you again soon when both our boys are travelling well. Will be thinking of you and sending you positivity and prayers.